Vanuatu’s Yoshua Shing has made a clean sweep at the 2017 Pacific Mini Games after taking out the Men’s Singles title last night in Port Vila. The number one seed capped off a perfect tournament by defeating New Caledonia’s Jeremy Dey in a thrilling seven games final. Dey took the opening game, but the pair stayed neck and neck until the fifth, where Shing was able to break the deadlock and win consecutive games to lead 3-2. The number two seed from New Caledonia wasn’t going away and took the sixth to push the match to the decider. But with a little help from an enthusiastic Vanuatuan crowd, the home town hero was able to get over the line and win the deciding game 11-4. 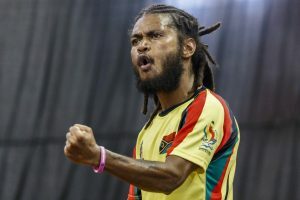 After the clinching the win, Shing celebrated stomping the ground and shouting “haus blong me!”, the Bislama for “this is my house”, to the fans. With four gold to his name, the Pacific definitely belongs to Yoshua Shing. In the Women’s Singles Priscila Tommy made a successul comeback from retirement, taking home the gold medal. She defeated her teammate and surprise finalist Stephanie Qwea 4-0 to take top place on the podium. In the playoff for the bronze medal Anolyn Lulu ensured it would be three medals for Vanuatu as she defeated New Caledonia’s fourteen year-old Lorie La in a seven game contest. Meanwhile in Para singles, it was Fiji that dominated, taking gold in every event on offer. Check out the full results from the Pacific Mini Games here.